Wenger teaches the players to cross and weave. 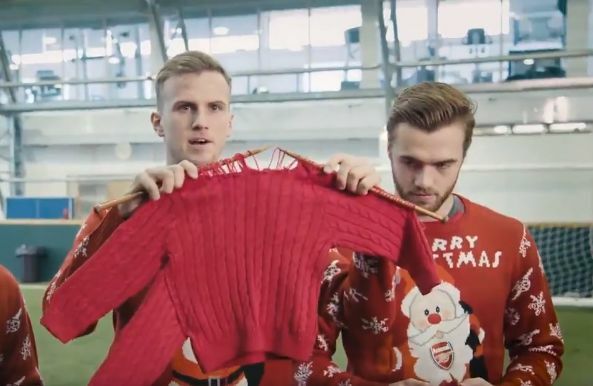 Arsenal are supporting Save the Children’s Christmas Jumper Day campaign this year and released a short clip of Arsène Wenger giving a knitting lesson to a few of the players. Ahead of the 2017 event on Friday December 15th, the club have made a series of festive jumpers available, which Calum Chambers, Rob Holding and Alexandre Lacazette can be seen sporting in the video, with 20 per cent of each sale going to the charity. However the manager is left disappointed by the squad’s knitting efforts, despite his instructions to ‘cross and weave’. The Arsenal Foundation has been supporting Save the Children since 2011 and has reportedly raised more than £2m for the organisation’s work.